Say hello to our new favorite salad. But no matter the source, the end result is far more delicious than the original we tried (not to brag, but for real), and it’s insanely easy to make! Shall we? 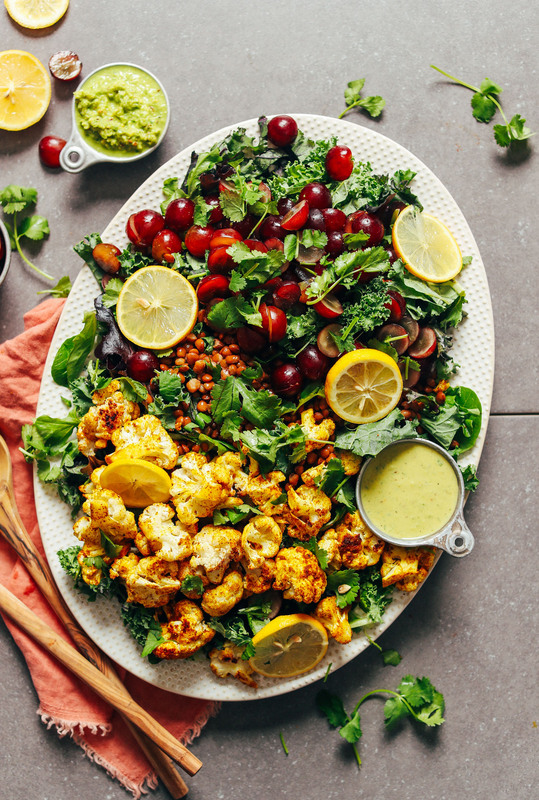 This 30-minute recipe starts with a base of greens, cooked lentils, red grapes, and the star of the show: curry roasted cauliflower. 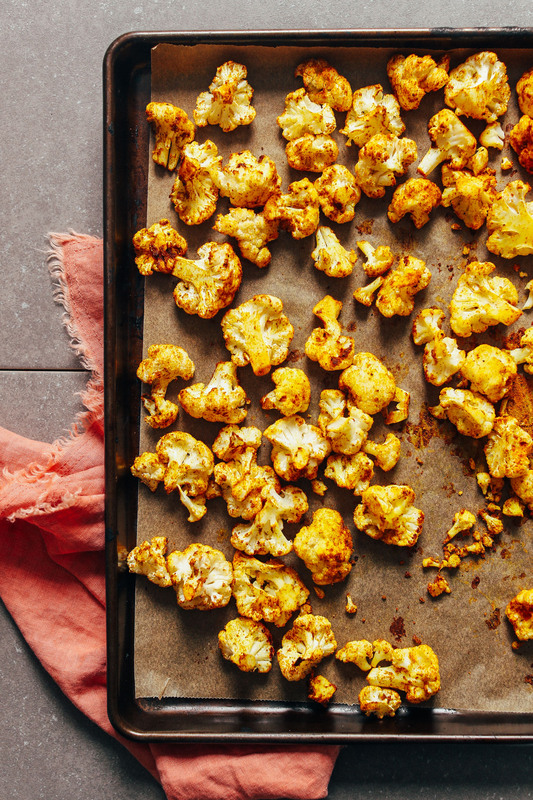 We tossed one head of cauliflower in a bit of salt, coconut oil (or water), and our DIY Curry Powder (swoon) and roasted it to perfection. The result is crispy-on-the-edge, tender-in-the-center cauliflower bursting with flavor. 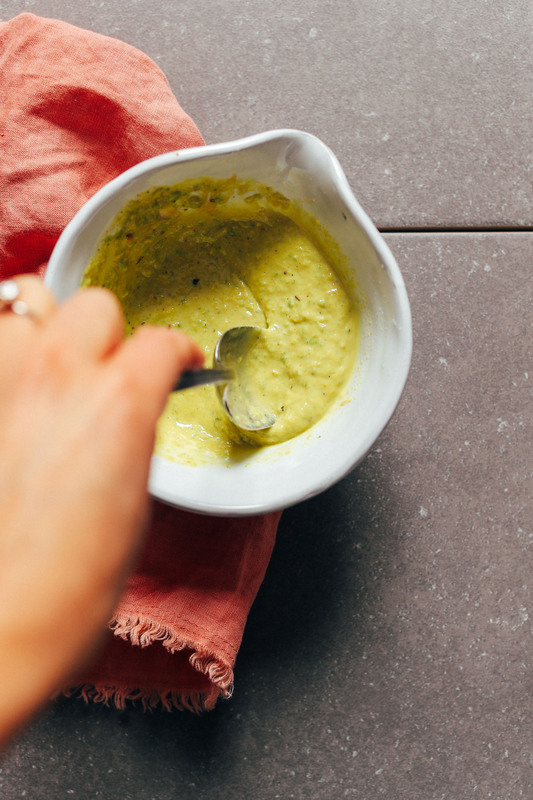 Next comes the dressing, which is a mixture of our go-to Green Curry Paste – that color tho! 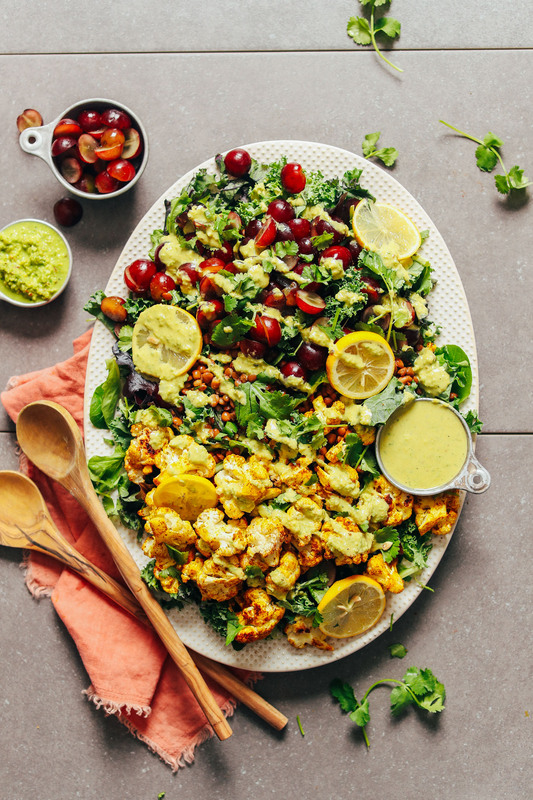 – and tahini, resulting in a creamy, savory-sweet, punchy dressing that marries this salad together beautifully. This would make the perfect weeknight meal when you need something healthy and satisfying on the table fast! It also keeps well, which makes it ideal to make ahead and pack along for lunches throughout the week (just serve the lentils and cauliflower chilled). 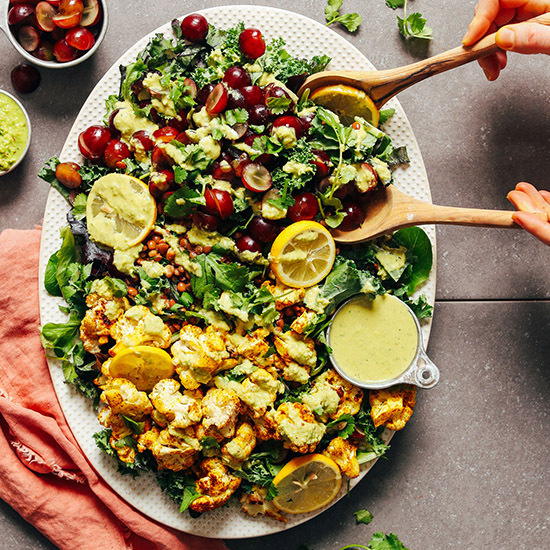 If you’re into salads, also be sure to check out our favorite Garlicky Kale Salad with Crispy Chickpeas, Roasted Vegetable Salad with Chimichurri, Curry-Roasted Vegetable & Lentil Kale Salad, Loaded Kale Salad, and Abundance Salad with Savory Tahini Dressing! If you try this recipe, let us know! Leave a comment, rate it, and don’t forget to tag a picture #minimalistbaker on Instagram so we can see what you come up with. Cheers, friends! 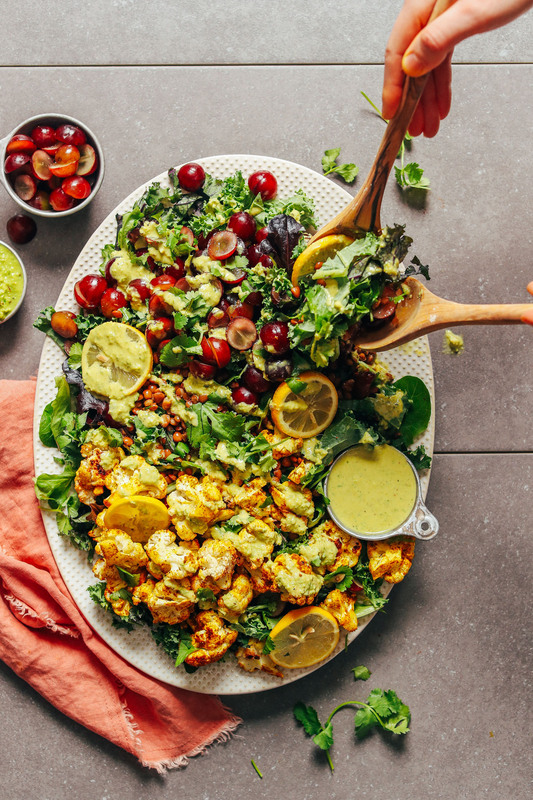 Crazy delicious kale salad topped with red grapes, lentils, and curry roasted cauliflower. Served with a tahini-green curry paste dressing! Just 30 minutes required for this flavorful side or entrée. Preheat oven to 400 degrees F (204 C). Line a baking sheet (or more as needed) with parchment paper. Add cauliflower to a mixing bowl and toss with coconut oil (or water), curry powder, and sea salt. Transfer to baking sheet and roast cauliflower for 20-25 minutes or until golden brown and tender. Prepare dressing by adding green curry paste, tahini, lemon juice, maple syrup, salt, and pepper to a mixing bowl and whisking to combine. If needed, thin with water until pourable. Taste and adjust flavor as needed, adding more green curry paste for a stronger curry flavor, tahini for greater thickness, lemon juice for acidity, or maple syrup for sweetness. Assemble salad by adding lettuce to a serving platter or bowl. Top with lentils, grapes, and cooked cauliflower and serve with dressing. Optional: garnish with fresh cilantro. Best served fresh. Store leftovers in airtight container for 3-4 days. Store dressing separately for up to 1 week. *Prep time does not include preparing green curry paste. *If you like heavy dressing, multiply the recipe x 1 1/2 or 2. *Nutrition information is a rough estimate calculated without optional ingredients and with all of the dressing and the oil. This was wonderful! I used the only lentils I had , red but it still worked. Served over spinach and kale. Really had great flavor combinations and looked yummy too. Thanks so much for sharing, Sandy! So glad you enjoyed it! Another delicious salad. I served it on kale, which I think was ‘hardy’ enough to take the weight of the other ingredients. The dressing was too spicy for me so next time I’ll halve the curry paste (I guess it all depends onto brand, I used store-bought). We’ve been making this recipe once a month for a while now. The only thing I’ve ever changed is the grapes. They are not always affordable so I swap them out with whatever fruit is on sale at the time. Everyone I serve it to loves it. My kids devour it! The dressing is where the magic happens. I made this yesterday to take to a potluck. Modified by leaving out the green curry paste (time factor) and lentils, and substituted sweet potatoes for some of the cauliflower. It tasted fantastic and i got lots of compliments. Thanks for a great recipe. I would have given 5 stars but my mods make the recipe a touch different. Yay! We are glad to hear it, Julie! Absolutely delicious! I added a few tomatoes and thinly sliced red onion on the bed of greens. I love that it’s so versatile and you can add your own twist. I will definitely be cooking the curried cauliflower as an addition to other meals. Thanks. This salad was phenomenal! I followed the directions with no substitutions (except maybe a little extra lemon juice and I added hemp seeds for crunch), and used store-bought curry powder and green paste in the interest of time (will try the homemade versions soon!). The bold curry with the sweet grapes and the hearty lentils was the perfect combination for a summery salad. Delicious and incredibly filling– highly recommended! I’m sharing this recipe in a post I’ve written for Care2.com for National Salad Month. I just wanted to check if it’s okay to use one of the photos? I’ll obviously give you credit and link back to Minimalist Baker. Hi Angela! Thanks for reaching out. For recipe and image sharing guidelines, check this article out! I love this salad! Thank you! I have made it twice, once with raisins (instead of grapes) and kale, the next with grapes and salad greens. Both were great. I definitely recommend using the lemon in the dressing, the lime juice was all I had on hand for the second time I made it, and I preferred the lemon. This is one to make again and again. This salad is awesome! I made the green curry paste as directed in the linked recipe and so glad. It is delicious and will definitely have many other uses. I used cooked black barely I already had instead of cooking lentil and worked out well. I feel like you can you use any grain you have handy and will be great. In Spain we loven lentils. I will try this helathy variation. Just made this! Very yummy and healthy. Love your recipes. This is so good! I used apples becasue it’s what I had and it was very tasty! Thank you! This salad is amazing! I am in love with it’s bold flavors. Of course I am a curry fan anyway. I took the extra step of making the curry powder recipe instead of using a premade mix from store since I had all of the spices on hand. Definitely worth the effort. I have made quite a few of your recipes and they have all been great. Thank you for helping me keep my family’s meatless meals flavorful and delicious! ? We had this yesterday evening with homemade bread – so fast, so easy, so yummy! Used only 3 Tbsp of curry paste though, was enough for our taste. Thanks for the great recipe! We’re glad you enjoyed it, Yulca! I made this for dinner last night (for my nonvegan/nonGF fiancé) and he loved it. He thought it was so creative. I loved it too!! I added brown Basmati rice to bulk the dish up for him! I would recommend the cilantro on top (I ended up adding more) because it gives it such a wonderful flavor. I also used the Thai Kitchen brand of green curry paste with success. Am definitely going to attempt to make my own paste in the future though as yours looks so vibrant and fresh in comparison to my jarred variety (whomp, whomp). Thanks, Dana! Another incredible recipe! This salad is amazing! While cauliflower roasted I threw the remainder together- quick and easy with ingredients I always have on hand. I have made several of Dana’s recipes this week and loved every one- going to order her cookbook tonight! I made this with a thai curry paste that was neither green nor red ;-) and probably too spicy – I mixed in an avocado and some more water to make it milder and I used cashew cream instead of tahini because I don’t like sesame. It turned out amazing and I’m definitely going to make it again. Some soft bread or pitas or so would be nice with it , and I think pineapple would be just as yummie as the grapes or could go in additionally! loved it! Thank you <3! Thanks for sharing your modifications! I just made this and it was absolutely delicious. I followed the recipe pretty much exact except I cut back a bit on the curry paste because I was afraid it would be too spicy for my tastebuds. Even the curry on the cauliflower gave it a bit more zing than I was expecting. The juicy grapes paired with the zing of the curry really give you a mouth full of flavor! Delicious! Delicious! I had some cauliflower I wanted to use for lunch yesterday and the newsletter with this recipe popped up just in time! Next time I make it, I’m going to add a larger portion of grapes because the flavor pop was surprising and tasty! Thanks for another great recipe. Lovely! Thanks for sharing, Rochelle. Oh my, I can imagine how mind-blown you were at the airport when you tried this salad! I’ve had incredible airport food before, but nothing worth replicating. Glad you found this recipe because it looks delicious! I want to add some tempeh into this recipe as well for some more protein and iron! If I do not have an oven how else would you suggest to make cauliflower? I would say sauté on the stove top to brown the exterior, and occasionally cover with a lid to steam the inside. Good luck! I actually have all the ingredients! Woot! I am absolutely making this tonight! Thank you! Made this with the homemade curry paste (without the bell pepper as I don’t digest it well) and it was delicious, absolutely loved the dressing! Even my partner who doesn’t enjoy cauliflower usually said it was very good. Served it on a bed of brown rice to make it more filling. Thank you! I made the cauliflower using Thai curry powder and it came out just as yummy! (It’s what I had at the moment) I would make it again. Thank you! I made the cauliflower using that curry powder and it came out just as yummy! (It’s what I had at the moment) I would make it again. Thank you! This looks amazing. What type of lentils did you use? We used canned organic brown lentils. This looks amazing! How do you think it would taste with red curry paste instead of green? hmm, definitely different. I like the lightness / herbal quality of green curry paste (especially our DIY recipe). But if you try it with red let us know how it goes!